Acrylic, acrylic dispersion with powdered pigments, sequins, glitter, cut painted paper, and acryloid resin on canvas over panel, 16 x 20 inches. Acrylic dispersion with powdered pigments, glitter, mirrored mylar, cut painted paper, and acryloid resin on canvas over panel, 60 x 54 inches. Acrylic, acrylic dispersion with powdered pigments, sequins, glitter, cut painted paper, and acryloid resin on canvas over panel, 60 x 54 inches. Acrylic dispersion with metallic pigments, glitter, sequins, mirrored mylar, cut painted paper, and acryloid resin on linen over panel, 16 x 20 inches. Powdered pigment in acrylic dispersion, glitter, and cut painted paper on canvas over panel, 48 x 40 inches. Acrylic, cut painted paper and acryloid resin on canvas over panel, 40 x 44 inches. Acrylic, acrylic dispersion and powdered pigments, glitter, cut painted paper, and metallic paper on canvas over panel, 72 x 72 inches. Acrylic, glitter, cut painted paper, sequins and acryloid resin on canvas over panel, 60 x 48 inches. Acrylic, glitter, and cut painted paper on canvas over panel, 48 x 48 inches. Acrylic, glitter, painted paper and acryloid resin on canvas over panel, 24 x 32.5 inches. Acrylic, acrylic dispersion and powdered pigments, glitter, sequins, rice paper, cut painted paper on canvas over panel, 24 x 32.5 inches. Acrylic, glitter, spray paint, metallic foil, holographic foil, painted paper, and acryloid resin on canvas, 60 x 84 inches. Acrylic, glitter, spray paint, metallic foil, sequins, cut painted paper, and acryloid resin on canvas, 44 x 48 inches. on canvas, 60 x 48 inches. and acryloid resin on linen over panel. 16 x 20 inches. Acrylic, glitter, sequins, bugle beads, cut painted paper, and acryloid resin on linen over panel, 16 x 20 inches. Acrylic, glitter, metallic foil, sequins, frosted mylar, cut painted paper, and acryloid resin on linen over panel, 16 x 20 inches. Acrylic, glitter, powdered pigments, cut painted paper, and acryloid resin on linen over panel, 16 x 20 inches. Acrylic dispersion with powdered pigment and and cut painted paper on linen over panel, 24 x 18 inches. Acrylic and cut painted paper on linen over panel, 11 x 14 inches. 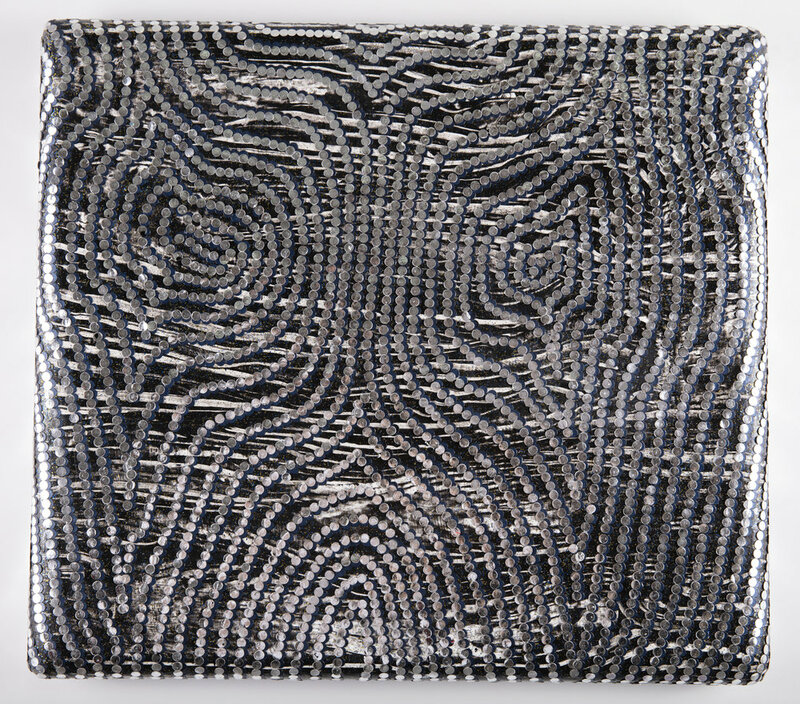 Acrylic dispersion with powdered pigment and cut painted paper on linen over over panel, 20 x 16 inches. Acrylic dispersion with powdered pigment and cut painted paper on linen over panel, 20 x 16 inches. 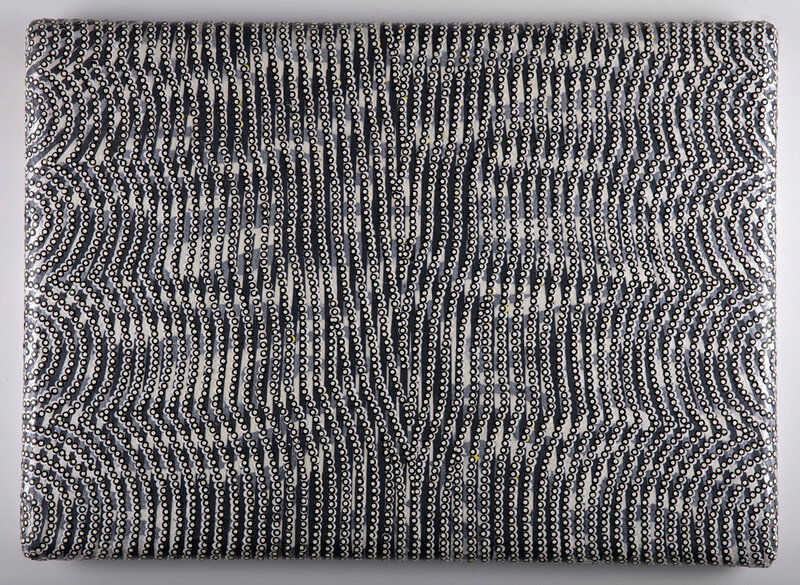 Acrylic, glimmer, and cut painted paper on linen over panel, 20 x 16 inches. Acrylic, metallic glimmer and cut painted paper on paper mounted on canvas, 94 x 60 inches. Powdered pigment in acrylic dispersion, acrylic and cut painted paper on paper, 60 x 40 inches.